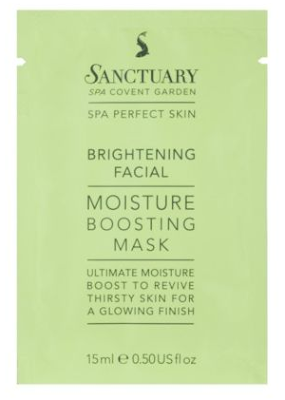 For my Birthday I received the Sanctuary Skin Brightening Facial In A Box Kit and I decided to use the Moisture Boosting Mask today because my skin has been really dry this winter. thirsty skin for a glowing finish. in an even layer on face and neck. - Leave on for 15 minutes. - Wipe away with damp cloth and pat dry. I used the entire mask on my face and neck as instructed and it really didn't go far. Maybe I have a big face? (I hope not) The mask didn't set like a traditional mask instead the consistency was more like a moisturiser. 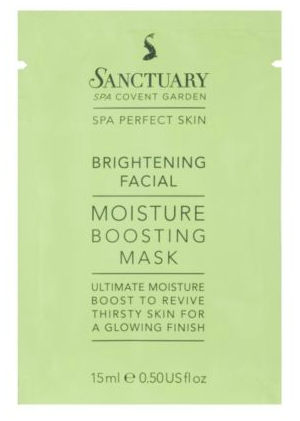 I didn't hate this product nor did I love it - yes it did make my skin softer, but nothing a normal mask wouldn't do or a moisturiser (as this is what the consistency remind me of). The sachet is available to purchase from Boots (without purchasing the whole kit) for £2.03 which I think is steep for a 15 ml sachet. I wouldn't purchase this mask separately as it didn't do anything amazing for my skin - I'm sure there is something better out there in the market for my skin!